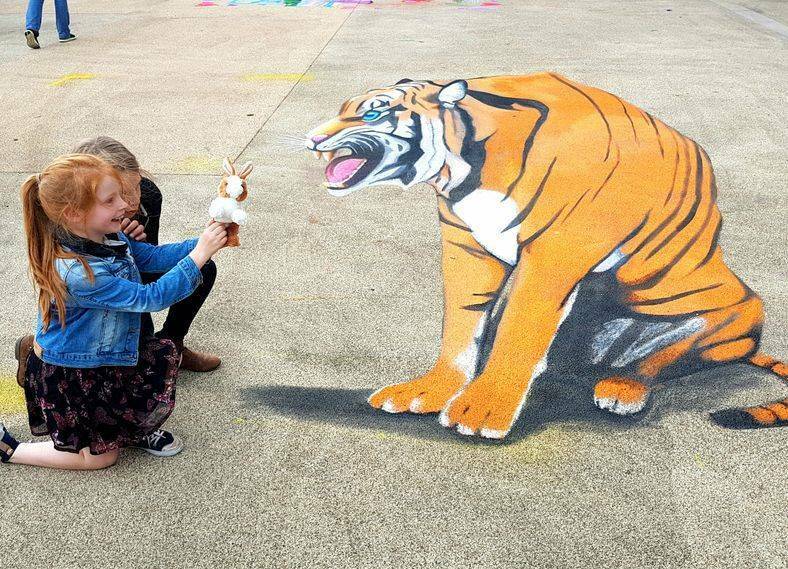 This fun bit of anamorphic Chalk art was created by Dean at the Gloucester Coloured Earth Chalk Festival in July 2017. 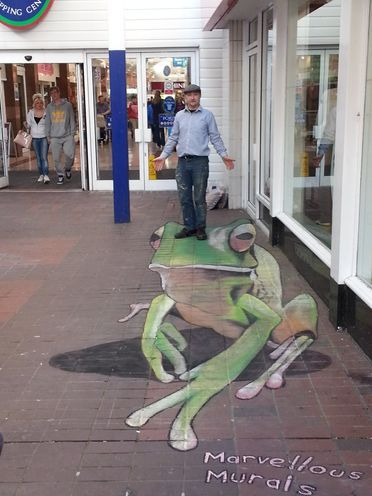 Here is a collection of temporary art that we have created using just chalk. This is a fun and exciting way to alter a space for a specific event or theme, that can either be washed away after the event with water or allowed to fade away naturally. 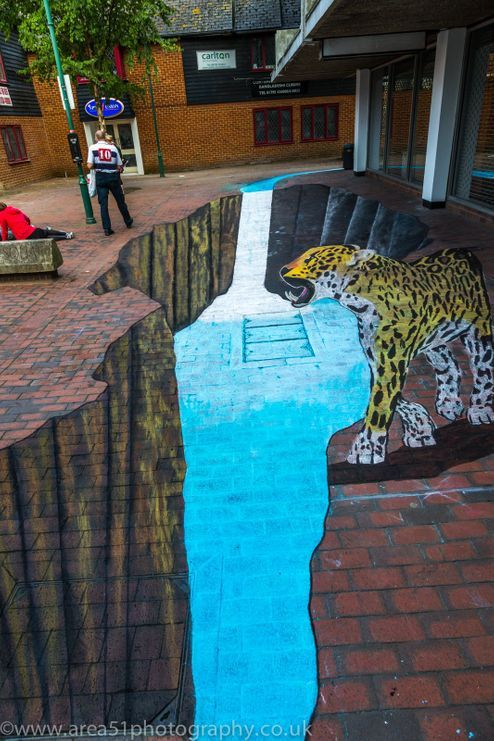 Bold and colourful designs can be created to capture the public awareness and we can even create optical illusions in the form of anamorphic art. This is a painting that is stretched out across a space so that when it is viewed from one point it has the illusion of being 3D. This works very well for raising social media profiles as it is very photogenic. On the Sunday of the Chalk It Up! 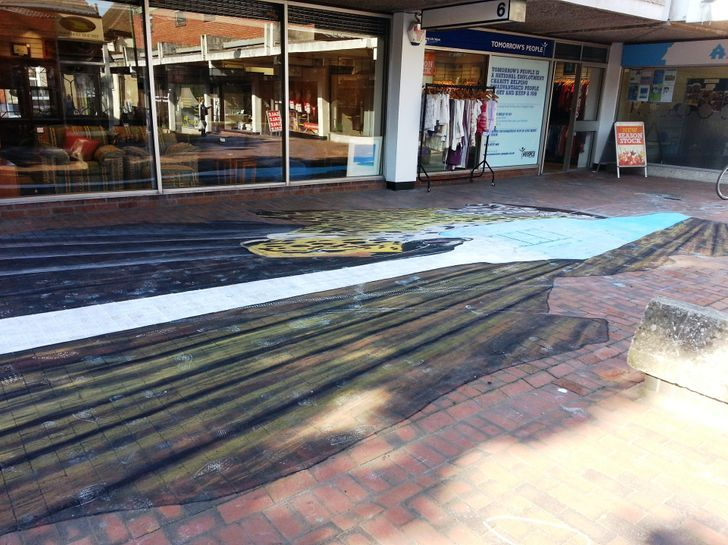 Sittingbourne chalk art festival, a group of artists worked together to created a huge anamorphic piece of chalk art in Roman Square. 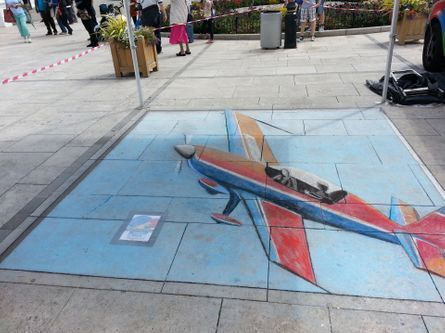 For the Herne Bay Air Show we decided to chalk a 3d stunt plane. We were given an excellent spot by the entrance to the pier and set up our gazebo in case of light showers. 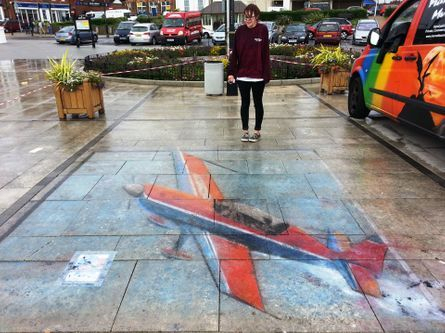 The weather wasn't great that day and so a lot of the planes got cancelled, but we persevered with our chalking. We were close to finishing when all of a sudden a storm hit and despite our best efforts to cover the plane with tarpaulins to keep it dry, it was washed away. 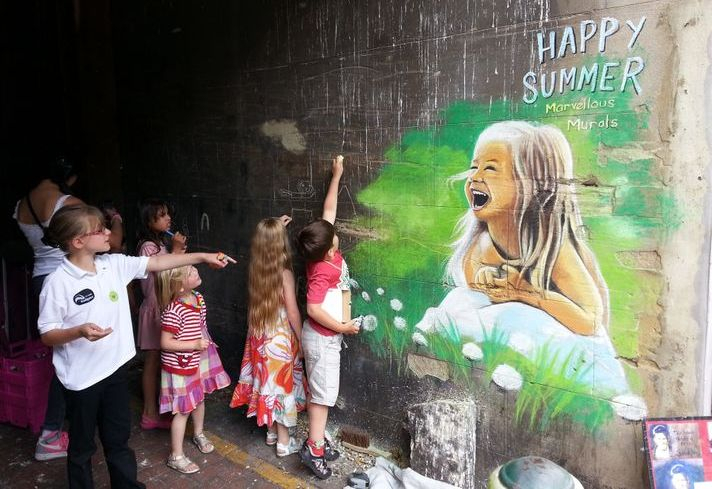 This piece of chalk art was created on the 21st of June, the Summer Solstice and longest day of the year, so we used a summer theme! This was also the day of the Sittingbourne Carnival. This was completed in about three hours. 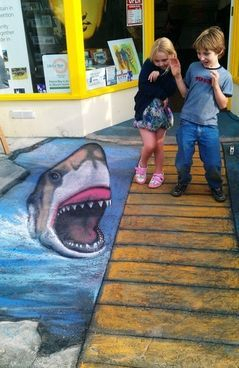 This is an anamorphic piece of chalk art that we did for the Sci-Fi by the Seaquel science fiction festival in Herne Bay. This took us about five hours to complete. 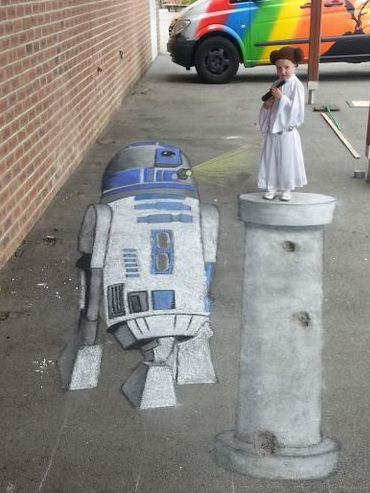 Once it was finished, children could stand on the 'plinth' and from the right angle it would look like they were being projected by r2d2! 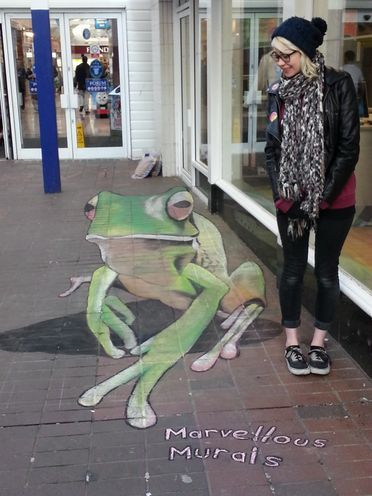 This is a chalk art frog that we did for the community day at the Forum in Sittingbourne. 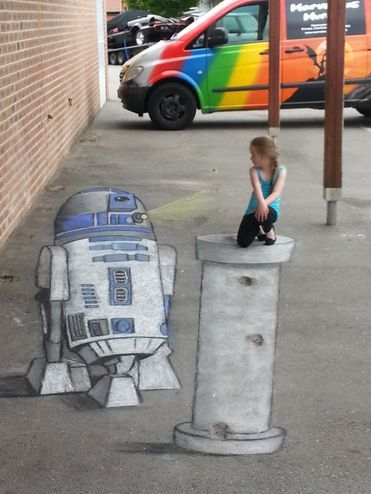 We made it 3D by using an anamorphic art technique. It was completed in about three hours. 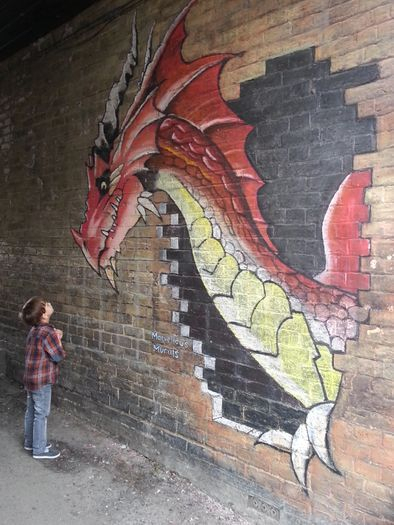 This is a dragon that we chalked in an alley way on Sittingbourne high street for the St Georges day celebrations. It took us about six hours to complete. We spent a couple of weeks in the summer at The Herne Bay pier trust gallery exhibiting some of our canvas work. 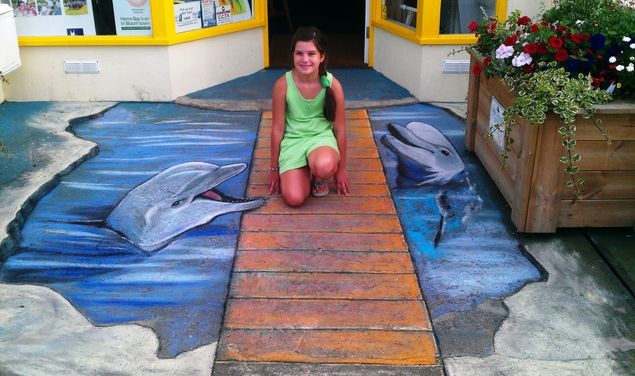 Whilst we were there we decided to do some anamorphic chalk art. The picture is drawn or painted in such a way so that from the view point you can see the picture literally jump out at you. 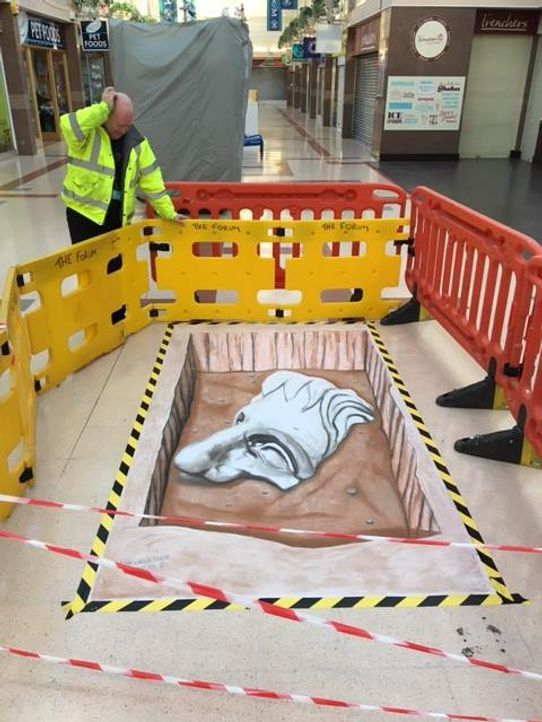 This fun 3D piece of anamorphic chalk art was drawn on a large piece of paper and placed in the Forum Shopping Centre for an April Fools trick.